Ask fellow campers about "Happy Campers RV Park" and nearby attractions. 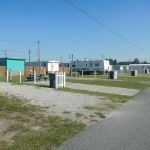 Nice large park of manufactured homes development for rentals to military service people for the local army base. In a small town residential neighborhood. Long and wide back-in sites with grass, table and concrete parking pad for tow vehicle. No trees so no shade but good satellite signal. Good Verizon signal, cable TV and campground Wi-Fi. Office staff friendly and helpful. Nice laundry. No pool or rec room and no common restrooms or showers. Not for family weekend camping, but great for travelers. Quiet. 30 miles to Savannah. Will stay there again. We camped at Happy Campers RV Park in a Fifth Wheel. Are you affiliated with Happy Campers RV Park ?